In his GM debut, Mr Lottridge pays tribute to Alec Wilder, one of America’s most original composers who combined the music of popular song, jazz, and modern classical. Wilder won wide compositional acclaim with his works for chamber symphony, orchestra, opera, ballet, theatre, film and especially with his popular songs written for such stars as Frank Sinatra, Bing Crosby, Ethel Waters and Mildred Bailey. Mr Sinatra was so enamored with this great composer’s music that he recorded and conducted Wilder’s pieces for solo woodwinds with orchestra! 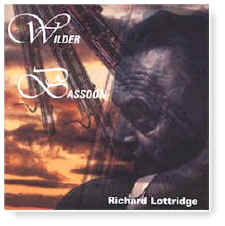 This much anticipated release beautifully conveys both Wilder’s seriousness and playfulness, and features the first ever recording of Suite Number II for Clarinet and includes his rare piece for four bassoons here recorded as a tour-de-force finale by the remarkable Mr Lottridge. Recorded 18-20 September 1995 at Mills Concert Hall at the University of Wisconsin.